So the key point is that it is generally hard not just to get to the curve itself from where your current dot is really at in the attainable region, as discussed above, but it in some cases it can be challenging even to move along the curve. So pondering this just this past July, I emailed Dr. Michael Watson of Northwestern University and his new firm OpEx Analytics, Watson is also a regular SCDigest contributing writer and a true world class analytics expert. My question: are tradeoff curves real? His answer: "I believe they are very real. I also believe that you can shift the curves with innovative technology or processes-- but even then there are still trade-offs you must manage." So this week I am at the excellent Logility software Connections user conference in San Diego, and run into Dr. Sean Willems, who is simply one of the sharpest minds we have today in supply chain. Willems co-founded inventory optimization company Optiant, which Logility acquired a few years ago. He remains Logility's chief scientist, and just recently left his alma mater MIT to take the position as the Haslem chair of supply chain analytics at the University of Tennessee. Let's just say his credential are pretty solid. "Tradeoff curves," he tells me. My supply chain spider sense is tingling a bit. Willems has been thinking hard about tradeoff curves for the last few years, it turns out. His presentation, which I will do my best to summarize here, was outstanding. I will start by noting that Willems likes to use the concept of supply chain "efficient frontiers" in place of tradeoff curves, which I will explain in just a bit. This curve should look familiar - but with a bit of a twist. The tradeoff curve itself represents what is achievable today, based on current resources, technology, etc. But importantly, that does not mean that a company is currently operating on its true curve. The "dot" representing current cost and service performance could be anywhere "attainable" region - and the farther away from the curve that dot is, the worse the supply chain organization is currently performing. That is why Willems uses the term "the efficient frontier" - the curve represents the border line between the attainable (lowest cost for a given service level) and the unattainable (again given current resources). And he adds that even getting to that efficiency curve from where a company is really operating today is generally not easy. It might, Willems said, as there is less latency of information between planning cycles. But maybe it's the opposite. The planning might actually become less efficient by trying to do it so frequently, and maybe costs would actually increase with a faster cadence. Willems then made the key point - a given company has no idea what lies to the left or right (faster or slower cadence) of using a monthly planning cycle. And circling around, this fact is in large measure why I ask Watson if supply chain curves are real back in July. My mind was in the same place as Willems described this scenario in San Diego. I am not sure if this is a generality or for some specific company, but Willems then showed a chart that indicated the optimal planning cadence was actually about 22 days - let's say three weeks - rather than a month. But again, for most companies, making this change from monthly to three-week S&OP cycles would take a major effort and process change, and would obviously not be without risk. Now let's get back to the efficient frontier. There isn't one curve, Willems says, but several - and this gets to the point of not moving along the curve, but fundamentally shifting it - lower costs and better service at the same time. That is shown in the image below. 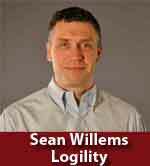 A small shift from the current efficiency frontier Willems calls the "attainable" - what a company can achieve in immediate term, with small changes to resources, operating policies and better use of technology. But then there is long term curve, or what I might suggest Willems should call the "aspirational." This is a major shift of the curve, what a company can do in the future, with a business case that justifies changes to resources, operating policies and in my experience also usually a major change in supply chain technology. Any reaction to this discussion of supply chain tradeoff curves and the efficienct frontier? What can you add to the discussion? Let us know your thoughts at the Feedback button (email) or section (web form) below. I don't really care if I get mentioned personally, but I did the first off the self commerical work on supply chain trade off curves when I was a scientist/programmer for IBM. I ended up applying for a Patent with them, and won an award for it. The patent application covered graphical interaction with trade off curves in a general way that didn't mention supply chain in particular. It's worth pointing out that computing a trade off curve for a reasonably sized optimization problem is more "parallelizable" than computing a single optimal result for a really hard optimization problem. That is to say, if your optimziation problem is really hard, then adding 100 computers to work on it parallel will be unlikely to give you a 100X (or even a 10X) speed up. But if you're optimization problem doesn't take that long to solve in one instance, and you need to solve 100 somewhat similar instances in order to compute a trade off curve, then 100 machines might actually get you (almost) a 100X improvement (and even more likely a 10X improvement). The concepts were nicely explained - well written, great examples, critically important topic. The trade-off curve was an active part of the management thought at different times during my 37 years with IBM depending on management. The first burst I saw was in the 1980s. From 2005/6 to 2008/9 it was active part of the supply chain management applications for IBM Micro-electronics Division. In a 2011 chapter for a book edited by Reha Uzsoy authored by the IBM team (John Milne, Chi-Tai Wang, Brian Denton, Peter Lyon...) the concept was developed in the initial pages leading into more detailed material. Over an extended period of time I have found the concept a powerful way to link models to business decisions - especially involving "costs" to handle business preferences. By coincidence, the folks mentioned about working with Reha have written a short paper on the concept of the efficiency curve with some simple, but very helpful examples title: The Supply Chain Efficiency Frontier & Smart planning Engines - Lessons from IBM - the first draft is done, but they are working on some interactive models. The IBM stuff was and is still in regular production - changing the landscape of what is possible. Besides the book chapter, material can be found in Interfaces. two great concepts that hide behind this paper are that: We can push the current frontier by making short cuts with new technologies today. What also means that companies and the market need time for transition period? To evaluate all implications economic impacts and social impacts related to decision that could follow the validation of models. It is great to take the time needed for POC. Proof of concept. Point to point optimization initiatives are possible and we also have end to end optimisation with different options. Just a case to illustrate what Sean and Dan are describing in this paper. During an S&OP implementation in a paper mill manufacturing the S&OP cycle was set at 20 days following what the company could realistically do taking in account the project team capability, the tools supporting the forecasting wheel the planning wheel and the execution wheel. A fair compromise was 20 days to complete the cycle for everyone engaged in the S&OP process. Under the perception of maturity the team decided to reduce the S&OP cycle from 20 days to 15 days in the surface that was a great idea that we could easily achieve but by zooming in the details of each S&OP meeting preparation activities, adding the risk assessment, the validation from different process owner we quickly realised that the effort require to secure the change was far ahead of what the team could achieve realistically without a profound modification of processes, tools and organization. Effectively, I have borrowed this whole idea of efficient frontiers from Sunil Chopra’s book on supply chain management. The graphs you have shown here raise a few questions for me personally, since I understand that the primary goal firms pursue is to improve responsiveness (service levels). And this involves cost trade-offs. I doubt if any company attempts to compromise on its responsiveness merely to become more cost efficient? It will only render it less competitive. Getting back to the graphs, my observation is that if a firm wants to move from its current service level of 80% to a target service level of, say 85%, it needs to move downwards (towards attainable). Now, that implies reduced costs as well. How does one explain this? Please correct me if I am wrong.